Just a handful of really exciting game this weekend but certainly some room to think that there might be an upset here and there. Many teams we thought had the talent to be serious contenders have lost games or not looked quite as good as we thought and while they might not be competing for a spot in the playoff any longer, they sure can ruin somebody else's road to glory. 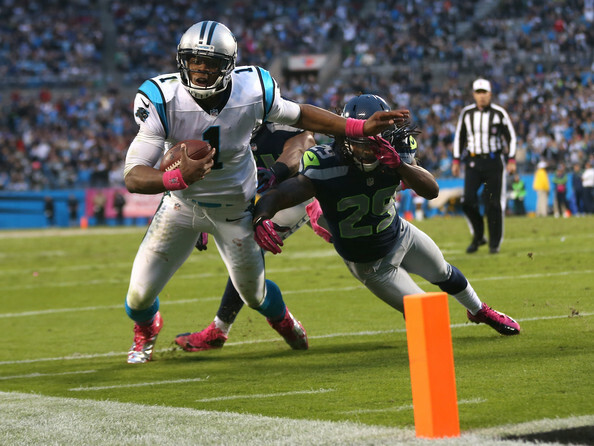 Cam Newton brings a whole lot of offense to the Seattle defense. The biggest news from the past weekend is the loss by Baylor to previously unranked but always saucy looking West Virginia team. The Mountaineers QB, Clint Trickett, to WR, Kevin White combo has been one of the best in the country this season and it really stood out against a Baylor defense that hasn't looked as bend but don't breaky as usual these past few weeks. Alabama absolutely destroyed Texas A&M too. I definitely did not see that coming as A&M's offense appeared to be an unstoppable juggernaut until about two weeks ago. In other news Notre Dame and Florida State played a toss up. Both teams looked great and while Florida State won, I think this game showed that both teams are Playoff contenders. Kansas State beat Oklahoma which is somewhat surprising unless you've seen them both play this year. Kansas State QB, Jake Waters is very good. TCU blew out Oklahoma State which is notable as the horned frogs absolutely outplayed Baylor last week except for the final minutes of the game when they incredibly gave up 24 points to lose. At this point I'd rate TCU over Baylor despite last week's game. It looks like the Big Ten is going to come down to Michigan State and Ohio State with Nebraska a somewhat close third right now. The Pac12 is a total mystery if you just look at the box scores but I still think Oregon is the best team by a wide margin. The SEC is totally up for grabs but I think Georgia looks like the best team in the East. The Big12 comes down to TCU and Kansas State with West Virginia a surprising third for me at this point but they are really just getting into the swing of their schedule. Oh yeah, the ACC still exists. Could they be more boring? UNC, Virginia, Pitt, BC, Miami, blech! These teams are all so mediocre or bad. Syracuse and Wake Forest are so bad they almost don't even count. Nobody longs for 1983 quite like ACC fans, except maybe Notre Dame fans (that glorious year they started retirement!). Perfect! FSU and Clemson are easily the cream of the crop here but FSU already beat them without their best player on the field. Boring.